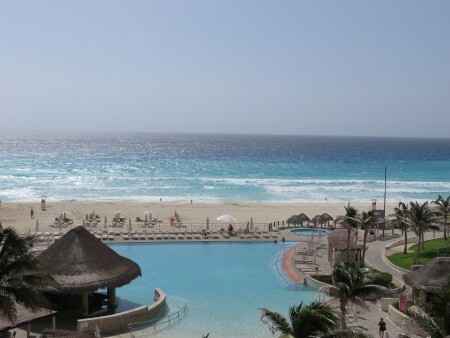 I know it may seem like I just reminisced about Cancun not that long ago, but in no time at all a year flew by and we were headed back for the next go round. Luckily, with the group I went with there was never a dull moment. Ready to return the Mexico with me? The sunburn was still covering half of my back, I’d probably find errant bits of sand in my clothes for months to come and Delta Airlines was going to have to do a lot of kissing up to redeem itself stranding us for a day, but despite all this I still had a great time on my second trip to Cancun, Mexico. Already it was hard to believe we’d gotten back just a few weeks ago, but that’s how vacations always go: you anticipate it so much beforehand, it just goes by in the blink of an eye, then it’s back to the grindstone. Although our flight was at 8:20 in the morning, getting unexpectedly upgraded to first class on Delta, made it much more bearable. Now for some of you, this may not be a big thing, but for me it was kind of a big deal. Yes, I’ve travelled a good bit to some far-flung places, but I’d never travelled in first class. Now I know how the other half lives, and I’ve been spoiled by it. How could you willingly give up better snacks, alcoholic drinks at no extra charge, a pillow and blanket waiting for you when you sit down in your seat and what seems like a giant chair by airline standards? After this, I can’t go back to coach – I won’t. The view of the hotel pool and ocean from our room’s balcony. Don’t deny you’re jealous. We landed in Cancun before 11 AM and after quickly getting our bags and breezing through Immigration (blissfully empty), we found a cab and were on the way to the Westin Lagunamar – the same hotel we stayed at the year prior that is perfectly located in the middle of Cancun’s Hotel Zone, directly across the street from a giant shopping mall, La Isla, and the lagoon. Juan Pablo greeted us as we checked in, apologized that the room wasn’t ready yet, and gave us a buzzer to carry around that would go off as soon as we could go up. OK, no big deal. Sean and I both had books, got a couple of towels from the pool and took up residence on some beach chairs to pass the time before our room was clean. It was a cloudy, slightly rainy day our first day there, so finding a couple of free lounge chairs wasn’t a problem. In less than an hour, our buzzer went off, we went up to our room, and when I saw our digs, I didn’t mind in the least we’d had to wait. This year, we had a suite: a kitchenette with a sitting area, a separate bedroom that had doors to close it off from the main living room and a giant bathroom: big Jacuzzi tub, big rainforest-style shower, the whole nine yards. Yeah, I can wait a bit for that. After a minor inconvenience in which the door didn’t close all the way and the maintenance guys had to come replace the piece in the door jamb, Sean and I both realized we were famished. It was 2 PM, after all. So down to one of the local restaurants in the hotel we went for a snack. While we were there, the rest of our group filtered in freshly back from The Taco Factory. Yep, this is the main pool area: one of at least three, I believe. At about this time, it began absolutely pouring outside. Not exactly pool weather, but maybe an hour and a half later it was over and we were all across the street at a restaurant right next to the lagoon enjoying oversized margaritas, daiquiris, Mexican beers, etc. We stayed there until almost sunset (which wasn’t stunning due to the cloud cover), then everyone piled into a cab to go down the street for dinner at La Distileria – a tequila distillery-themed restaurant. One of the main reasons we went was because our friend Lidia, who lives in Cancun, recommended it for its chicken mole. If you haven’t ready my prior blog waxing poetic about mole sauce, here’s a quick recap. It’s a Mexican sauce made of about thirty different ingredients (very labor intensive) including chocolate, and everyone who makes it, has a slightly different recipe. If you so much as say “mole” in Sean’s presence his radar goes up and he’s game, so it was a given that that was what he ordered for dinner, I ordered the chiquihuite on poblana sauce (chicken in a puff pastry served over a green huitacoche and poblano pepper cream sauce) and it was delicious as well. Most everyone had a clean plate by the end of the meal, but none of us was ready to go home. Instead we decided to go dancing. 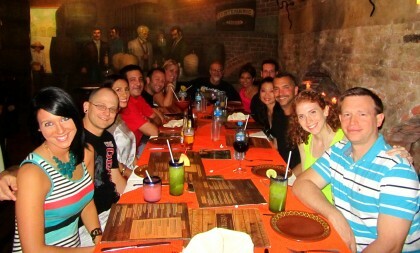 The quintessential group dinner shot at La Distileria. Photo courtesy of Adam Jones-Kelley. Fast forward half an hour and one donkey-in-the-back-of-a-pickup-truck later (no kidding about the donkey), and a group of us were in the open-air club Mandala in Cancun’s bustling nightlife district. Since our group was so large we managed to negotiate bottle service for the table; and between all of us, two handles of vodka and one bottle of tequila were polished off in the course of the evening. I got to dance my shoes off, which was awesome and just what I wanted. Even though as soon as you left the club, your head felt like it was in cotton, it was still a great time. I was confident I’d regain full hearing soon. And that was our first night in Cancun. 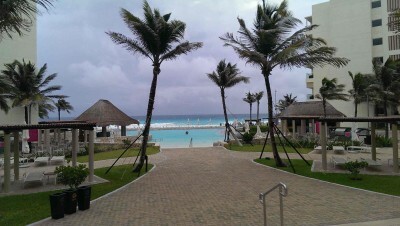 Rain and early flights aside, it was a great start to my return to Cancun. What’s in store for the rest of our trip this time around? Stick around for my next blog post – there were sea turtles involved! All dressed up to dance like mad. 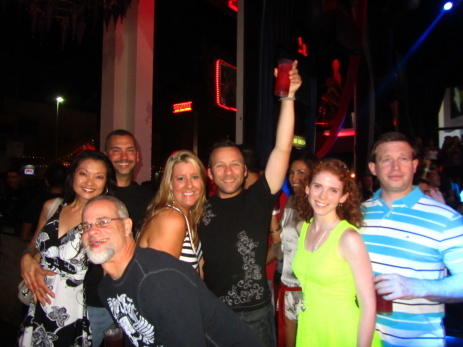 This entry was posted in Mexico, North America and tagged Cancun, Club, Dance, Mandala, Mexico, North America, Tequila, Travels on June 18, 2014 by Paige N..